The BJP on Sunday released its first list of 72 candidates to contest in the Karnataka assembly elections 2018, to be held May 12 for the 224 seats across the southern state. “The central election committee of the party has decided the first 72 names for the ensuing Karnataka legislative Assembly elections,” said the BJP in a statement released by its state unit. The committee met under the party’s national president Amit Shah. Other members of the committe, such as Prime Minister Narendra Modi, Home Minister Rajnath Singh and External Affairs Minister Sushma Swaraj also attended the meet at the party’s head office in New Delhi. Among the candidates are many of the party’s 48 sitting or outgoing legislators from the state’s northern, central and southern regions, including Bengaluru, which has 28 Assembly constituencies. Prominent nominees are the party’s chief ministerial face B S Yeddyurappa from Shikaripura, K S Eshwarappa from Shivamogga, Jagadish Shettar from Hubli-Dharwad Central, Basavaraj Bommai from Shiggaon, C.M. Udasi from Hangal, K.V. Hegde from Sirsi and B. Sriramulu from Molakalmuru (reserved). For Yeddyurappa, the BJP’s CM candidate, this is a do-or-die election as it will be seen as a prelude to the 2019 general elections as far as South India goes. For the Congress, on the other hand, this is an election for survival. Karnataka is one of the few states in India where they still hold power – and the party will be looking to retain the state. 1. BS Yeddyurappa to contest from Shikaripura: State BJP President and the party’s CM candidate BS Yeddyurappa will contest from Shikaripura. B Sriramulu, the party MP from Ballari district will contest the Assembly polls and will be the party’s candidate from Molakalmuru in Chitradurga district. BS Yeddyurappa’s rival within the party, and former party President K S Eashwarappa will contest from Shimoga. First list of 72 BJP candidates for ensuing general election to the legislative assembly of Karnataka 2018 finalised by BJP Central Election Committee. 2. Only three women figure among the 72 contestants: Sashikala Jolle from Nippani Assembly segment in the state’s north-west region, Roopali Naik from Karwar in the coastal area and Poornima Srinivas from Hiriyur in the central part are the only female candidates among the 72 whose names have bee announced. Jolle is re-contesting from the same seat, while Naik is a former civic corporator from Bengaluru and Srinivas is the party’s women’s wing secretary. 3. ‘Rahul, Sonia will lose their LS seats in 2019’: “Sonia Gandhi and Rahul Gandhi will lose their respective constituencies due to people’s growing ‘disappointment’ with them,” BJP said on Sunday. BJP spokesperson Anil Baluni said Rahul Gandhi should not worry about Modi and rather be concerned about his and Sonia Gandhi’s electoral fate in 2019. “In the kind of circumstances prevailing today, both Rahul and his mother Sonia Gandhi will lose from their seats, Amethi and Raebareli, respectively. They have done nothing in their constituencies and the people’s disappointment with them is growing,” he said. 4. Six-time Karnataka MLA joins BJP: The BJP’s campaign in Karnataka Assembly polls on Sunday received a boost with six-time MLA Malikayya Guttedar, an OBC leader, joining the party. B S Yeddyurappa, who is the BJP’s chief ministerial candidate in the poll-bound state, and Union minister Prakash Javadekar made the announcement at a press conference also attended by Guttedar, an MLA from Afzalpur in Gulbarga district. Guttedar was recently expelled from the Congress after reports appeared that he might leave the party and join the BJP. 5. Nationalist vs state agenda in Karnataka: ‘Nationalist agenda’, as the Congress dubs, has become a problem for the BJP as it cannot alter it to suit the state’s narrative and has been forced to stay neutral on boiling issues — the state flag and Lingayats’ status, as they go against its core ideology of Hindutva and state autonomy. 6. Karnataka election details: Polls will be held on May 12 and the votes will be counted on May 15. Karnataka has seen bitter campaigning ahead of Karnataka elections, by both the parties. Leaders from both parties including PM Modi, Congress chief Rahul Gandhi and BJP’s Amit Shah visited the state multiple times over the past few months. The JD(S), led by former prime minister H D Deve Gowda, is the third player in the fray. The ongoing term for the Karnataka assembly, which has 224 seats, expires on May 28. 7. Chitradurga Mutt’s head seer urges Amit Shah to support minority status for Lingayats: Seer Shivamurthy Murugha Sharanaru of Chitradurga Mutt wrote a letter to Amit Shah, requesting him to support the Karnataka government’s decision of granting minority status to Lingayats community. In the letter to Shah, Seer termed the ongoing movement in Karnataka between the followers of Lingayats and Veerashaiva Lingayats community as a ‘temporary outbreak of emotions’, which will not last long. “Minority status to this religion will deliver some benefits to youth of community-individually and collectively. It is not a step to divide community but measure to unite divided sub-castes of Lingayats,” the letter read. 8. Siddaramaiah govt has announced a minority status for the Lingayat community:The Karnataka government recently accorded a minority status to the Lingayat community. This came days after Chief Minister Siddaramaiah-led government accepted the suggestions of the Nagamohan Das committee to grant a separate religion status to the Lingayats. The decision, taken ahead of the state Assembly election, was criticised by the Veerashaiva Lingayat Samanvaya Samiti and termed as politically motivated. The Lingayats owe loyalty to the social reform movement of the 12th century, initiated by Basaveshwara. Living mostly in North Karnataka, this community is believed to constitute 17 per cent of the state’s population which makes them a key political catchment for parties. * Date of notification is April 17 and nominations should be filed by April 24. The last date of withdrawal of candidature is April 27. Counting of votes will take place on May 15. 10. Different regions and historical voting trends: In Karnataka, the 2008 assembly elections was won by BJP comfortably with 110 seats, whereas the 2013 assembly elections was swept by the Congress by winning 122 seats. The alternating results and trends may suggest that any party is capable of performing well throughout the state on their given day. Karnataka is divided into 30 districts and 4 administrative divisions and this geography of Karnataka is contained within 6 distinct regions. Different factors make these 6 regions conducive for one party whereas unfavourable to others. 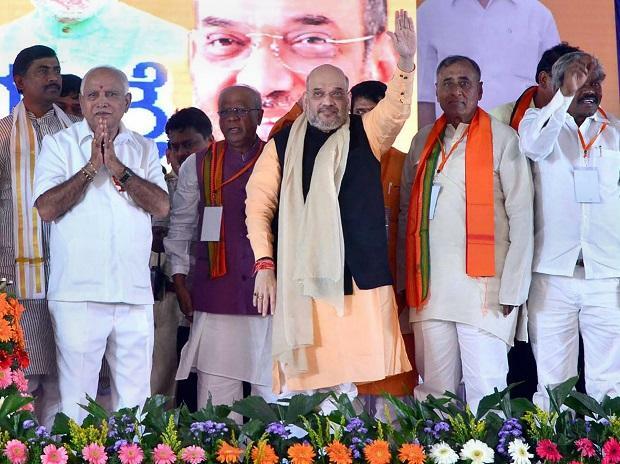 Old Mysore region – All the three primary political outfits the BJP, Congress and JD(S) have somewhat equal influence in the Old Mysore region of the state. Mumbai-Karnataka region – The Mumbai-Karnataka region is dominated by the Lingayat community who have their inclination towards the BJP. Hyderabad-Karnataka region – The Hyderabad-Karnataka region of the state is also dominated by the Lingayats and Reddy brothers, both of which are traditionally BJP supporters. Thus BJP has an advantage here as well, but Mallikarjun Kharge a prominent backward class leader of the Congress and the leader of opposition in the Lok Sabha belongs to the said region too. This will ensure advantage Congress on many seats which have sizeable votes from the backward community. Central Karnataka – In Central Karnataka both the BJP and the Congress are expecting to perform well.